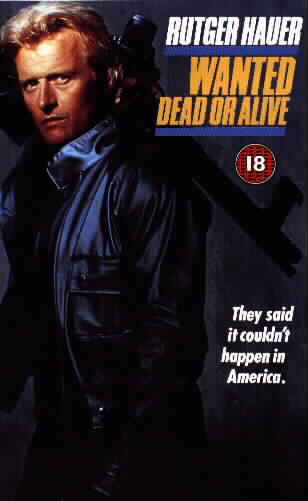 Nick Randall (Rutger Hauer) is a former cop turned bounty hunter. An unflappable, immovable finder of wrong doers with a magnificent dirty blonde centurion helmet of mulletted hair. Nick has few friends aside from one cop who he once worked with and his girlfriend. Nick left the force to be rid of the red tape and the rules, for as we all know rules and red tape only slow lone cops down. So Nick is somewhat surprised when the FBI call on Nick to help track down a bad guy. An unshaven, swarthy, menacing terrorist foreign type (played by Gene Simmons of KISS fame) who is plotting to kill thousands of Americans. Nick remains surprised and reluctant all the way until the FBI man offers him $250,000 80s dollars with a bonus if the bad guy is taken alive. Even while working alone with minimal input from the FBI and police force Nick still finds that he can fall victim to the untrustworthy and opportunistic. Of course it all gets quite personal. Nick even gets to be presumed dead for a little while, before everything wraps up nice and easy in the big climactic showdown that these films demand. This is the 80s after all. Unfortunately this is also the period before Rutger embraced his awkward B movie appeal and started mugging his way through proceedings. While effective in parts and containing a couple of moments you likely wont see coming, Wanted: Dead or Alive, is all rather dry. Final Rating – 6 / 10. A competent action film, but not one that will warm the hearts of those who discovered Rutger through Split Second and the awesome Blind Fury.